Thin chocolate chip cookies with toasted chopped hazelnuts. Sift together flour, cream of tartar, baking soda, and salt, in a medium sized bowl. In a large bowl, using an electric mixer on medium speed, beat together butter and brown sugar, until creamy. Beat in egg and vanilla, until combined. Beat in flour mixture, until combined, followed by the hazelnuts and chocolate chips. Chill dough in refrigerator for 30 minutes. Preheat oven to 375 degrees F. Line a large sheet pan with parchment paper, or grease using preferred method. Shape chilled dough into 1-inch balls. Roll balls in cinnamon-sugar mixture and place on sheet pan, about 2 inches apart. Bake cookies at 375 degrees F for 10-12 minutes, until golden brown. 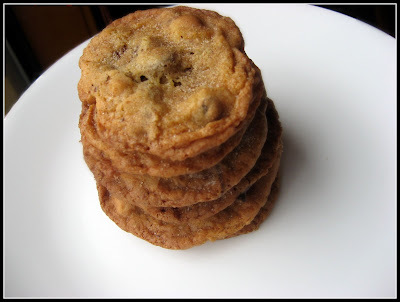 Cool cookies on pan for 2 minutes, then transfer to wire racks, to cool completely. *To toast nuts, spread out in a single layer on a baking sheet. Toast in a 350 degree oven, stirring occasionally, for 10 to 12 minutes. 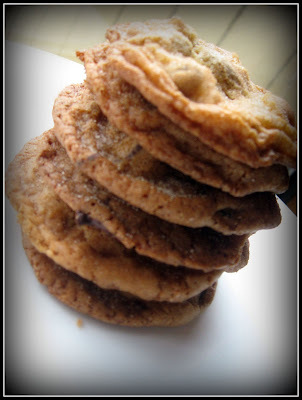 9 comments on "Cinnamon-Hazelnut Chocolate Chip Thins"
I love the sound of these cookies. Anything with chocolate is all right in my books! Sounds like a good time of a party!! These cookies sound amazing. I am definitely saving this recipe. Emiline, there is not a single ingredient of these cookies I don't love... mmmmmmmm and the picture looks so vivid, I could just pick one from the screen!!! Beautiful job! sounds wonderful! I love the combination of chocolate and hazelnut. Ok, so maybe Mom talks loudly on the phone, but at least she shelled all those nuts. The only advice I gave a young friend who was going to her first office Christmas party was to keep her top on. Oh my goodness those look awesome. What a good mom to shell those hazelnuts for you. Deb- It was quite the party, I must say. Sue- Heh heh, you're funny. I'm pretty sure a couple of tops came off. Anj- Thanks! Also, thanks for voting. Yeah, she's a pretty good mommy. I love hazelnuts and chocolate together. In fact I am going to be making hazelnut-choc biscotti for Christmas!